IMAGINE yourself waking up with the sounds of the ocean coming through the sliding door of the master bedroom. Enjoy a cup of coffee and relax on the screened porch and start the day right! Fresh paint, new wood floors, and soothing decor give this unit the welcoming and homey feeling you are looking for. This condominium is BEACH FRONT, which means that is located on the beach and provides a partial view of the ocean. It is located on the first floor of the southeast corner of the condominium complex. This allows a view of the ocean from the screened porch off the living room and from the balcony off the master bedroom. There are a total of four flat-screen TVs in this unit, each of them have cable service connected, one in the living room, and one in each of the three bedrooms. There is also a DVD player attached to the TV in the living room. There is also a wet bar, full-size washer and dryer, and all the cooking utensils you could desire. The 'highlight' of the unit is the full length-wise wall mirrors located in the living room and the master bedroom giving you a feeling of more space. There is also a screened entry for storing your beach chairs, floats, etc. No smoking is allowed inside the unit. Pets are NOT allowed. Pelican's Landing is located on Shore Drive and only a short walk to the popular Ocean Annie's Beach Club and The Apache Fishing Pier. There are bike rentals nearby, two pools on site, a playground, barbecue grills, picnic table, pool lounge chairs, two elevators, and luggage carts for your convenience. GREAT LOCATION!!! Shore Drive is considered a 'family zone' area. Shore Drive is a dead-end street which reduces the amount of traffic and provides some isolation from the hectic Route 17 'Restaurant Row.' Barefoot Landing and Broadway At The Beach are both nearby as well as several restaurants, Wal-Mart, and the Conway Bypass (Route 22) is very easily accessible. Network engineer in the the telecommunication industry. Father of one and step-dad of two. Enjoys golf, hockey, and lounging on the beach. Two of these three activities are easily done in Myrtle Beach. Previous to owning a condo, I had been visiting Myrtle Beach for several years for an annual golf trip with friends. On one visit, I decided that it would be great to have a place to come to and stay, since we did it every year. Now I visit twice a year, once with my family and the second is still for the trip with my golf buddies. There are no streets to cross to get to the beach, just walk down to the first floor and through the pool area. These are an optional feature. They are provided by the cleaning service that is used. Full size washer located in private Laundry room attached to unit. Full size dryer located in private Laundry room attached to unit. Note: The first floor is not the ground floor. Property was easy to access and upon arrival we found the place to be clean and comfortable for the whole family. The kitchen was great to use when we wanted to stay in rather than go out. The owner was always in touch and easy to contact whenever needed. The space was great and amenities were always easy to use. The easy access to the beach and pool was an extra plus. I would recommend this rental to anyone with a family or group of people. Unit was not clean. Counters were not wiped. toilets were filthy.Towels felt like sandpaper. We did not receive a welcome package. Kitchen lacked alot to be called a gourmet kitchen. And, only two of the 4 televisions worked. And I was informed the owner was aware of this. Electric can opener didnt work.Pots and pans were beyond repair. Iron was rusted and ironing board fell apart. Was surprised to find there were no beach towels at a beach resort. Security lock on the front door did not lock. 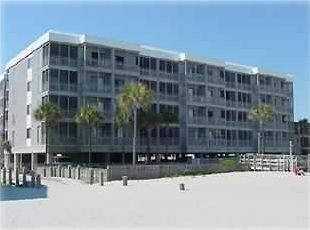 Overall, we were not pleased with the unit, but loved the location and all of the close access to beach and dining. Feel the unit was overpriced for the amenities. This is truly a disheartening review. I have always encouraged my guests to reach out to me directly, if anything prevents them from enjoying their vacation. I have a local cleaning service and property manager who may be reached for issues such as the ones reported in this review. I also provide my direct mobile phone number for my guests to reach me for issues they feel are not resolved. In this particular case, this is the first time I am hearing of the issues that this guest ran into, so I did not have the opportunity to address their concerns. In fact, I rely on my guests' feedback, especially in regards to cleanliness of the condo. This is my only way of knowing if they are doing a good job or not. All 4 TVs did work, however, the local cable company recently converted to a digital-only service, which did prevent 2 of the 4 TVs from having cable service. I have ordered a DTV device which will allow a 3rd TV to have content from the cable company. The 4th TV will have a Roku device that will allow for guests to stream content. I do provide a set of bath towels for everyone's stay, but I do not provide beach towels. My kitchen is far from being gourmet. If this is somewhere in my description, it is not correct. It is a standard kitchen, with standard cooking utensils. Great location and nice area, lots of space 3 bedrooms with 3 bathrooms , 2 patio decks , everything you need is in the condo, the kitchen has everything which makes it nice for eating in, we have stayed here twice and plan to stay again! The pool is great, security is 24-7 walking around. There are discounts for multi-week rentals. Monthly rentals are available in the off-season. Monthly rates are determined based on how many months are rented. The more months rented, the cheaper the rate.